Your transcript is your school's official record of the courses you've taken, are taking, or have transfered, and how they apply to your academic program(s). You'll find it on My Profile > Student. Your transcript is organized around your academic program(s). 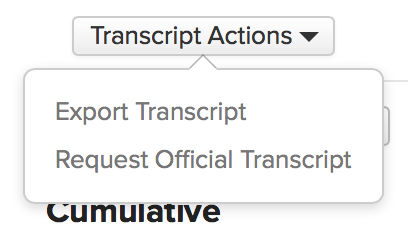 If you're listed in more than one program, use the drop-down to switch between your different transcripts. None shows you the courses, if any, that aren't mapped to one of your programs. Each term in which you've taken courses is shown on the transcript. In addition to your courses and grades, you'll also see things like your term and cumulative GPA, credits/hours, and grade points. You may see notes about disciplinary events—this entirely depends on how your school handles these items. At the end of the transcript, you'll see any transfer courses attached to this program. Export transcript: This creates a PDF of your unofficial transcript. Check if you wish to include an appendix with course descriptions. 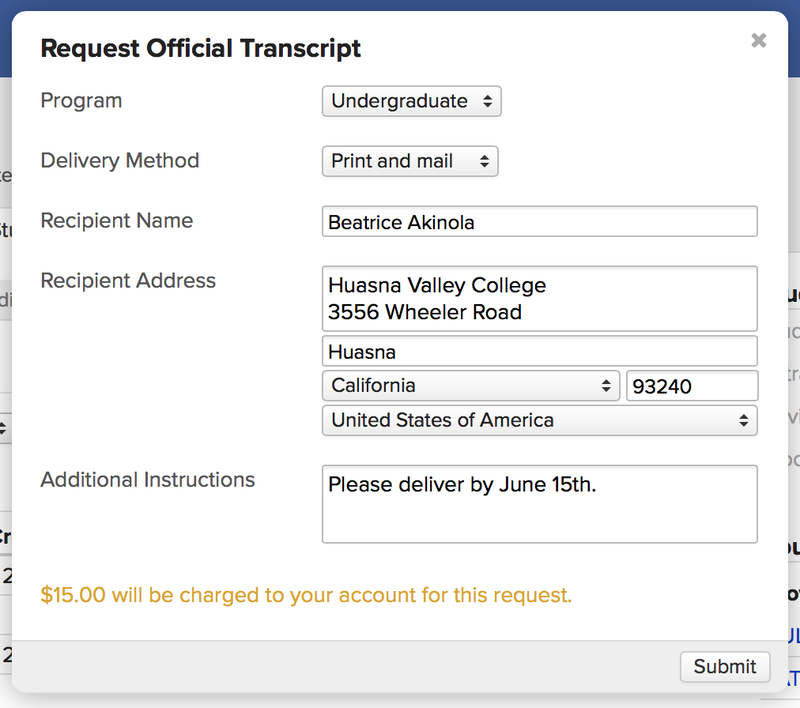 Request official transcript: This lets you request an official transcript from your school. Select which program you'd like a transcript for (if you have more than one listed). Select the delivery method for this transcript. Depending on your school's setup, you may be able to have the transcript printed and mailed and/or emailed. Depending on the delivery method you selected, enter the recipient's address or email. Enter any additional notes about the request. Your school may charge for official transcripts. If so, you'll see a notice about how you'll be charged for this request—or even a form in which you'll enter credit card payment details.